L: 89" x W: 40.5" x H: 38"
Anastasia Sofa Not one to go unnoticed, Anastasia knows how to make a statement. This sofa's classic roll arms and contemporary tapered feet offer stylish versatility—a decorator's dream! The stunning accent pillows make it easy to forget that this piece's upholstery is neutral, offering great versatility when it comes to design. Not one to go unnoticed, Anastasia knows how to make a statement. This sofa's classic roll arms and contemporary tapered feet offer stylish versatility—a decorator's dream! The stunning accent pillows make it easy to forget that this piece's upholstery is neutral, offering great versatility when it comes to design. Looks great but do not buy! Looks great and is comfortable in the beginning but the cushions flatten quickly and the frame creaks. We have had the cushions replaced 3x due to them flattening. We purchased the platinum care coverage and they replaced the couch due to the frame creaking and after 3 failed attempts of their technician fixing it. Do not buy. My husband and I purchased our first home two years ago. We decided to buy sofas at this store because we hear they last forever. Well two years later the sofa and love seat look like I’ve had them for more then 6 years. We are a family of 3 and we love spending time together in the living room watching movies. Had we known the cushions would flatten out and get fuzzies all over them we would have went with something else. We previously had bought sofas at Bobs and they lasted us 10 years and the price was cheaper there. Guess we will buy from Bobs again. Don’t waste your money on these unless you are going to use them as decorations and not sitting. Hi Evelyn. I'm sorry you've had a bad experience- we'd love the chance to make it right. Our customer care team will reach out to you and figure out a resolution you're happy with. Thanks for your feedback! This sofa meets all our requirements. It's comfortable and roomy. The grey color is just perfect for my den, not too light or dark. The throw pillows that come with it are quite large and look great against the grey couch. We are very happy with this purchase and hope to have it for a long while. They looked beautiful when we bought them. Unfortunately, the cushions have balled very badly. We have had the couches for less than two years and they feel terrible. Also, the pillows are down and feathers are everywhere. I love the look of them it’s too bad the material isn’t better quality! This sofa is poorly made and not worth the money. It’s comfortable but fabric is all creased and yet it is hardly used in my home and looks awful. The bad reviews I read were all true but clever sales woman convinced me otherwise and now I am stuck with this sofa. The fabric is too thin or not enough stuffing because it is always heavily creased and looks sloppy. Poor customer service too. They won’t take it back and didn’t give me the time of day, and didn’t return my call for 2 months. And though I paid extra for all the protection, this defect is “not covered” so I am stuck with this terrible sofa. Very disappointed! Hi Raffaella! I am very sorry to hear how you feel about the Anastasia Sofa and experience with our customer service. I would like to help resolve these issues and will have a manager reach out to you! Loved the look of this couch,but 6 months in its saggy and always looks disheveled. I wish I had gotten a sturdier couch! I'm afraid I'll be looking elsewhere for a new couch within a year?? This sofa set looks great, but it does not hold up to wear. The cushions have already lost their shape and the throw pillows are constantly shedding the feathers inside the pillows. If we could return this sofa, we would. We love this neutral grey for our formal living area. Comfy and classy all in one. The throw pillows are a great added touch. Very classy living room set! I love my new Anastasia living room set. It is very elegant looking. The fabric is high quality and soft. The pillows feel like they have a down-stuffing feel to them, very nice! It looked so pretty in the showroom... the cushions starting sinking in after 2 months on me and we had to get an inspector in to get new cushions approved. We received high density cushions and what not but still have an issue. Since we have a toddler and didn't spend too much on this couch when we purchased it we will wait until its time to say goodbye to it, but we will not be purchasing from Raymour ever again. There are always issues with our purchases. Sad but quality needs to increase. This is by far the worst purchase I think we have ever made. I felt under pressure as we had company coming and therefore made this purchase without much thought. It is less than a 9 months old and looks worse than the couch I had for 9+ years. I have made other purchases from Raymour including a couch found in their discount center and it looked much better than this after several years. The cushions sunk within a couple months. I’m constantly flipping them and trying to get them to line up with the seams. I’m all about using things till they are truly no longer good however I would not take in this sofa even if it was given for free. 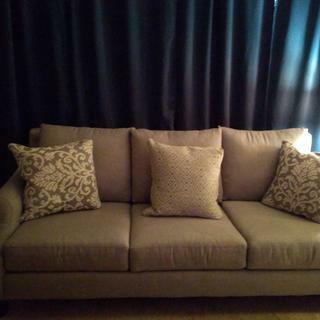 I purchased this sofa with loveseat, at the bronx location. The floor sample that they had was a mislead. They had a lighter shade of gray for sofa and the cream color next to it. I chose to buy the lighter shade of gray, but when I got it delivered it was a darker shade of gray. That was false advertisement, I called store manager Mrs. G. and she had the audacity to tell me that I needed to invest in getting the same lighting the have at the store to achieve the color. I had taken pictures of sofa before buying and compared and color was off. I should've immediately gone to store to compare color on pillows but unfortunately by the time I went they had already placed the proper color on the floor. I will not be buying there again. We bought this coach back in December 2016 for our living room. I chose the grey color b/c I have two children under the age of 4. So far (almost 9 months) we've had no complaints. This is in our main living room. People constantly sit here and lounge on these couches. People rave not only about the look but the comfort. CON: I always have to fluff the decor pillows but that is standard with any couch. I would totally recommend this couch for a high traffic or even in a den or a sitting room. Good find for that price point. Love the sofa. Throw pillows aren't the greatest quality, but overall super happy with this sofa. Although the couch looks great, it’s not as comfortable as you would think. Not really a couch for laying down and watching movies. The pillows are the absolute worst. They shed SO many feathers. The feathers are EVERYWHERE and i spend most of my day sweeping them, picking them off the furniture, clothing and everything else they attach to. Don’t buy if you are looking for a comfortable couch and a clean living room. This couch looked great and was extra comfortable at the store. After a month -- the accent pillow fabric tore -- similar to other comments the cushions sink in, the material for this sofa is horrible. For the amount of money spent -- this is by far the most disappointing purchase my husband and I have made. Looks great in the showroom, once at home fabric and cushions do not hold up. We have both the couch and large chair with ottoman in our "formal" sitting room which gets minimal use and the couch looked extremely worn after 6 months. Love this piece. Stylish and comfortable. Purchased for my new home and love it. We purchased two Anastasia sofas in February 2019 in the "turbo smoke" color, and we are very happy with the way the sofas look in our family room. The sofas are very comfortable and are complemented by two chairs from the same family. We've only had the set for about a week now so we haven't encountered any negatives yet! The pillows are also very comfortbale and are very thick. They really have some heft to them! We think they work very well with the color of the sofa. Our room isn't quite finished yet, but this was a major part of our vision and we're happy with how they fit in the room. The couch is a very comfortable product and goes great in our family room. The support is great and we love the high back rest as well. I am very pleased with the sofa. It looks great in my living room. The grey color is exactly what I was looking for. The sofa was worth the wait. It looks beautiful and really complements my decor. I would recommend it to anyone. I really love the pieces and variety that raymour and Flanagan provides. The Anastasia Sofa is a win! Comfortable and so soft to the touch. It feels so good and supportive on my lower back (where my last sofa fell short.) The pillows are plump and luxurious. I would buy this again and again, it looks and feels like I paid a LOT MORE than I did. Very pleased. This is a beautiful sofa, I love it!!! The pillows are comfortable. love this sofa. I got about a week ago for my house. Its confortable and affordable. if you want to decorate and dont know what colors to chose, this set will give you the versatility you need because the area rug and curtains can be of any color! We love the look of this sofa! It is the perfect place to curl up and read a book or stretch out and watch a movie. This piece looks best when paired with the chair and a half and settee so the patterns really pop! Very comfortable piece! and love the style along with the additional pillows. We absolutely love this sofa. It’s very comfortable and forgiving from grand kids spills. Bought this couch for my living room and it looks great! I love the design of the couch and the material. It is well-made and is very comfortable. I've gotten a lot of compliments on it too! Love it second time buying it. We love this sofa!! Very stylish and very comfortable. I am a big person and I sit comfortably in this sofa withoug sinking down, the cushions are nice and firm. I love this sofa !!! We love our new sofa, chair, and ottoman that we purchased! Our salesperson was amazing and patient with us. We will be back for our next purchase! Beautiful piece of furniture and super comfortable! Perfect for my space and I highly recommend! I've just redecorated my living room with Raymour & Flanigan products and I love it! The sofa is comfortable and the color matches everything I choose for decor. Thanks Raymour & Flanigan! Really enjoying my new Anastasia (Charcole) couch. It is small enough to fit into our awkward apartment door but big enough for 2 people to comfortably lay on. We love it! And the movers were seamless! this couch is firm but very comfortable! the throw pillows are heavy and well made not like most others that are light and cheap feeling. Love the style and color m very much happy to purchase this sofa . Looks great, comfortable and wet constructed. Love the throw pillows are elegant and comfortable. This couch is super attractive. The color and material are both great and it is very well made. I had a very soft older couch before that, so I am currently adjusting to the firmness of the pads on this one. If you like that aspect, you're golden, but if you want a big soft fluffy couch this one isn't for you. Looks great but maybe a slight firmer than I expected. It is getting broken in tho. I would recommend it. Sofa is roomy and comfortable. Pleased with the purchase for the price (bought at clearance center), but suspect the upholstery will not hold up well in the long run. The couch is lovely and the construction seems top notch. We are very happy with the look and the feel. The four throw pillows are a nice touch too. The bottom cushions are a bit firmer than the showroom couch but should ease with time. BEST ANSWER: The Anastasia Sofa is available in Turbo Smoke, which is actually the gray option shown or Turbo Sand which is the beige/off-white option. Is there extra cushions to buy? is this basically the tatiana chenille set, with a new name and color? is the fabric type of the couch also different? we bought this set literally 1 year ago (back when it was called tatiana chenille) and just wondering what is different about this Anastasia set that is identical to your old tatiana set we own. if it's the same, which it appears to be, what is the best way to clean these couches? * To prevent overall soil, frequent vacuuming or light brushing to remove dust and grime is recommended. * Spot clean using a mild water-based solvent or dry cleaning agent such as mild detergent or non-solvent upholstery shampoo. * Apply foam with a soft brush in a circular motion. * With any method, always pretest a small area before proceeding. * Use a professional furniture cleaning service when an overall soiled condition has been reached. Will the 100% polyester fabric pill? BEST ANSWER: The Anastasia Sofa does not have an issue with the upholstery pilling. My Anastasia has pilled terribly within a year of owning. Very disappointing. I had mine for two months before it started pilling terribly. What is the name of the style of the arms that are on the Anastaia sofa ? BEST ANSWER: The arms on the Anastasia are referred to as "sloped and flared roll arm." Thank you Enter a reply to DESIREE T.
I love that sofa, it is very sturdy, very comfortable and elegant, The back pillows are just different, if you prefer foam back cushions, then choose another sofa, but I am very happy with mine. Fabric is very nice, we already washed the covers few times, I have a 2 year old son. Randie, the couch looks great however my wife and I have had to have the cushions repaired twice due to them caving early. They finally sent us 5 new cushions but we expect to have the same problems. We have had the sofa for 2 1/2 years so far. I have had the sofa for over a year and haven’t had any problems with the pillows of any other parts of sofa. It is very comfortable. I have back issues and I can sit in this without any problem. No need to improve the pillows or the fabric. I have it for 2 years. I wash the fabric in the washing machine without any problem and the pillows are still very comfortable. Sofa is perfect after a year with a 2 and 4 year old playing on it. Thank you Enter a reply to Rosemary L.
I thought the Anastasia has new fabric that won’t pull, the Tatiana pilled , has it been made durable? BEST ANSWER: I purchased this sofa two years ago and have not had a problem with the fabric pilling. I love the lines and the look. However, the cushion quality is poor. I am glad that I purchased the premium protection plan because I understand it covers refilling the cushions within 5 years of purchasing and I will be taking them up on that. My sofa is almost a year old and the fabric has worn significantly and faded. Does Raymour and Flanigan protection plan replace the sofa if the fabric pills or wears badly? BEST ANSWER: Hi Karen. Please refer to our platinum protection coverage: https://www2.raymourflanigan.com/platinum-protection/furniture-guarantee.html For additional assistance, please contact online sales at 866.383.4484, option 2. We would be happy to explain in greater detail about the platinum protection coverage. Is the Anastasia turbo smoke the same color as the Tatiana pewter? BEST ANSWER: They are similar but not the same exact fabric color. The Anastasia has a darker gray shade. Hi there, for cleaning this couch, can you use an upholstery cleaner with a shampooer? BEST ANSWER: Here is our recommended cleaning for the Anastasia Sofa: Lightly brush or vacuum frequently to remove dust. Spot clean with a mild, water-free solvent or professional dry-cleaning product only. Pre-test cleaning methods on a hidden surface. A professional cleaning service is recommended for an overall soiled condition. What is the depth of the seat?Also,does csliforniaCalifornia preposition 65 apply here? BEST ANSWER: The seat depth of the Anastasia Sofa is 22". The Anastasia Sofa does not contain any chemicals that are banned under California law. What's the name of the rug in the picture ? BEST ANSWER: The rug is the Persian Empire Bone Area Rug, 7'9" x 10'10", SKU # 170918821. I have this sofa on order but am concerned it will not fit through my doorway. Will it fit through a 30-inch doorway? BEST ANSWER: The Anastasia Sofa does require a 32.5" wide or 90" high opening. Is the settee comfortable? I was thinking of purchasing instead of love-seat. BEST ANSWER: The Settee is very comfortable. Can you custom order different style feet for this sofa? BEST ANSWER: The Anastasia Sofa does not offer the option for different feet. iam not sure i if it fit through my door what are the dimensions? BEST ANSWER: The dimensions of the Anastasia Sofa are 89" L x 40.5" W x 38" W. The legs are removable, which will allow the sofa to be delivered through a 32 1/2" opening. Is the settee the same color as the pillow in the smoke color sofa? BEST ANSWER: Yes, the Settee and the accent pillow are the same fabric. Is this set available in a sleeper sofa option? BEST ANSWER: The Anastasia Sofa is not available with a sleeper option. BEST ANSWER: The upholstery on the Anastasia Sofa is a heavy-duty, stain resistant polyester, but is not considered microfiber. Are back pillows attached to sofa?